Paul McCartney announces that he is leaving The Beatles. The first Arbor Day took place on April 10, 1872 in Nebraska. It was the brainchild of Julius Sterling Morton, a Nebraska journalist and politician originally from Michigan. Throughout his long and productive career, Morton worked to improve agricultural techniques in his adopted state and throughout the United States when he served as President Grover Cleveland’s Secretary of Agriculture. But his most important legacy is Arbor Day. Morton felt that Nebraska’s landscape and economy would benefit from the wide-scale planting of trees. He set an example himself planting orchards, shade trees and wind breaks on his own farm and he urged his neighbours to follow suit. Morton’s real opportunity, though, arrived when he became a member of Nebraska’s state board of agriculture. He proposed that a special day be set aside dedicated to tree planting and increasing awareness of the importance of trees. Nebraska’s first Arbor Day was an amazing success. More than one million trees were planted. 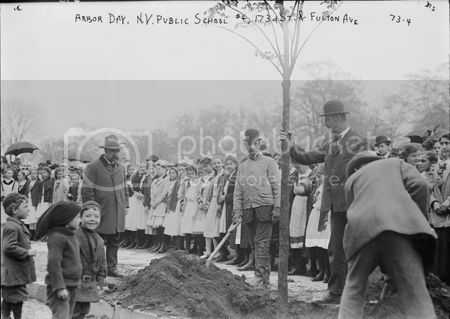 A second Arbor Day took place in 1884 and the young state made it an annual legal holiday in 1885, using April 22nd to coincide with Morton’s birthday. In the years following that first Arbor Day, Morton’s idea spread beyond Nebraska with Kansas, Tennessee, Minnesota and Ohio all proclaiming their own Arbor Days. Today all 50 states celebrate Arbor Day although the dates may vary in keeping with the local climate. Arbor Day is also now celebrated in other countries including Australia. The Great Gatsby is first published by Charles Scribner & Sons. The Great Gatsby written by F. Scott Fitzgerald is first published. The People’s Republic of China hosts the U.S. table tennis team for a visit in an attempt to thaw relations with the USA. 129 sailors die when the submarine USS Thresher sinks at sea.